The club was formed in 1896 under the name Caledonian, West Hartlepool. A mixed club this continued until 1939 when the men’s section disbanded due to the 2nd World War. During the season 1950-51 an extraordinary AGM was held at Linden Grove to discuss the name of the club. 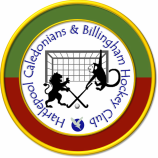 It was then Hartlepool Caledonians Hockey Club (HCHC) was formed as, primarily, a ladies club. Pre 1960's the hockey club held their general meetings at players houses until March 1962 when the club became a section of the West Hartlepool Cricket and Sports Club still retaining the name HCHC. At the 63-64 AGM it was decided that HCHC ladies would run two teams during the up and coming season. The club had gained new members due to the disbanding of the local TDSOB club. The 60's saw hard times for the club. The sport was becoming ever more popular but funds were low. In an event that would never happen during the present day it was decided at the 65-66 AGM that members would make the wrap-over skirts rather than buying them. In 1966-67 West Hartlepool Cricket and Sports Club disbanded and re-emerged as Hartlepool Cricket Club, playing at Park Drive which HCHC maintained as its base until season 2014-15. Hartlepool Caledonians through the 70's and 80's were often involved in tournaments, festivals and cups. In 1976 Callies joined the Durham Clubs Knockout Cup. An American team even toured and played Callies in Easter ‘74. In consecutive years 80, 81, 82 and 83 the ladies team toured Southend. During the August Bank Holiday in 1984 Callies organised the first of a number of festivals. The 1987-88 season saw HCHC joining the Durham County Woman's Hockey Association league – now the ‘Durham Clubs League’ under the management of a combined County Association. As the sport grew and the success of the team increased, the ladies winning the End of Season tournament and the Indoor plate, the need for sponsorship became evident and, in 1992, Willie Maddren become the main sponsor of the ladies team. The success of the club continued in ‘92 when they won the Indoor League and, in ‘93 they cleaned up as League winners, K/O Cup finalists, Beginning of Season tournament finalists and Indoor league and cup winners. Quite a season to remember! Unlike the ladies section the men’s game had more of a chequered history in the town. The earliest recorded game, in January 1896, involved the Nondescripts v Coxhoe which the home team won 6-1. By 1907 there was a 2nd club in the town, West Hartlepool, although it does not seemed to have continued after the 1st World War. By the 1920’s there were 4 men’s clubs – Grayfields, Caledonians, Hart and Richardson-Westgarth. Grayfields changed their name to West Hartlepool in 1935 and moved to Park Drive. Generally men’s hockey was suspended for the 2nd World War and afterwards it seems that only Richardson-Westgarth, who had managed some form of existence during the conflict, continued and took up the ‘West Hartlepool’ title, playing from Grayfields and perpetually providing cheese and chutney sandwiches for visiting teams. In September 1960 the club moved to Park Drive becoming Hartlepool Hockey Club and by the mid 60’s a 2nd team was introduced. Playing on a cricket outfield was always a problem with games regularly cancelled for fear of damaging the pitch so, in 1973, the club was pleased to take up the opportunity of moving to a new sports complex developed by Seaton Carew Cricket Club at Petrus Park [later renamed Hornby Park]. Their name was changed to Seaton Carew Hockey Club in 1976. The club reached the semi-finals of the County Cup on 3 occasions once at the expense of the mighty Durham University 1st team! Since its inception in 1972-73 the club has taken part in the North East Hockey League with their 1st team being the Division 2 Champions in 1994-95 and reaching their highest position of 4th in Division 1 in seasons 1995-96 and 1997-98 by which time the club was managing to field 3 successful teams. The club was a founder member of the local Indoor Hockey league in 1974 and has fielded between 1 and 2 teams consistently ever since. On the 27th January 1996 the Hartlepool Caledonians and the Seaton Carew clubs held a centenary bash to celebrate 100 years of hockey in Hartlepool. This was held at Seaton Carew Cricket Club and is remembered for the fun and frolics of their very own episode of Blind Date! This resulted in a closer association between the 2 clubs and, recognising the benefits of a merger, in the 98/99 season it was decided that the 2 organisations should combine into the one club. A general meeting was held on 13th September 1999 to officially decide the merger under the name Hartlepool Caledonians Hockey Club. The club colours were also merged, green from the ladies strip and maroon and amber from the men's. The merged club decided to use Park Drive as its base. In 2008 the club became sponsored by Wise Financial Consulting and this led directly to the obtaining of a Sport England grant of £10000 in 2011 which enabled the introduction of a permanent Junior Development Programme and the introduction of regular junior representative sides. In 2014, with an increased level of sponsorship, the clubs playing strip was changed to reflect the corporate colours of its main sponsor. In 1928 ICI's Commander Claris conceived the idea of a hockey tournament within the ICI’s sports associations. The hockey tournament was name "The Directors Trophy" and was a nation-wide competition for the ICI workforce, which were then spread all over the country. Such was the popularity in the North East several teams in the area were formed as feeders for the North East side. One of those teams was Billingham Synthonia Hockey Club, formed in 1934. The team being named after an agricultural fertiliser - Synthonia being an amalgamation of 'synthetic ammonia', a product manufactured by ICI in the Billingham Works. Since the 1930's, Billingham Synthonia has played in the local North East competitions and has affiliated to the Durham County Hockey Association. It joined the North East League in 1972. The game was played on grass up until around 1990 when Astroturf pitches were gradually phased in for all league matches – now the predominant surface for all field hockey. The Club went from strength to strength and in the early to mid-1990's had four Saturday teams, two indoor teams, a youth side and a Sunday side. Billingham's best league performance came when the First team gained promotion from North East Division 1 to the East Pennine League in the 2000-2001 season. In the 2009-2010 season Billingham Synthonia Hockey Club were down to one team and the decision was taken to drop out of the North East First Division and to start again in the Conference League. That season, Billingham gained promotion to the Fourth Division in the North East Hockey League. In 2010-2011 Billingham won Division 4 and were promoted to Division 3, which was redesignated as Intermediate League Division 2 for the 2011-2012 season with the club finishing in 3rd place. In the 2013-14 season they achieved 2nd place and were promoted into Intermediate League Division 1, remaining there during the following 2 seasons. Following the 2014-15 season talks commenced between the 2 clubs regarding a possible merger and, recognising the many benefits of such a move, it was decided to go ahead. Subsequently the AGM’s of both clubs voted unanimously to merge and this was formalised at a General Meeting on Saturday 20th June 2015 held at the new club house of West Hartlepool Rugby Football Club which was agreed as the new home of the combined club. Playing strips were to continue to be in the corporate colours of Wise Financial Consulting who would continue as the new club’s main sponsors.